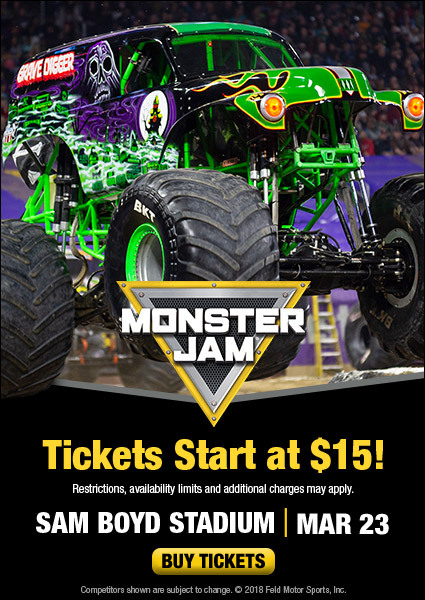 *This post is in partnership with Monster Jam, we received tickets in exchange for promotion. Monster Jam comes to Vegas at Sam Boyd Stadium Saturday March 23rd, 2019Pit Party 2:30-5:30pm / Show 7:00pm. Get up close and personal to the Monster Jam trucks and drivers by purchasing a Pit Party pass that allows you early access for photo opportunities and autographs. Pit Party pass must be accompanied by an event ticket. Bags that are clear plastic, vinyl or PVC and do not exceed 12″ x 6″ x 12″. Small clutch or purse no larger than 8″ x 11″ with or without a handle or strap can be taken into the stadium after proper inspection. This coming October 11 – 12, 2019 in Las Vegas, will be the inaugural Monster Jam All Star Challenge. Get included in the Preferred Customer Presale by signing up now. Tickets go on sale to the public May 7, 2019. Double Down Tickets, 2-day tickets and pit passes go on sale to Preferred Customers starting Tuesday, April 30. Click HERE to become a Preferred Customer for free.